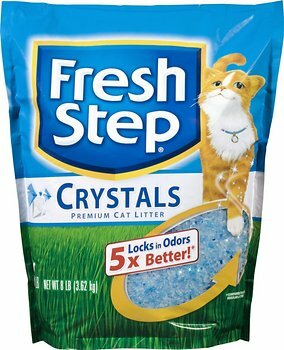 What’s the Best Crystal Cat Litter? Crystal cat litter is becoming more popular as it reaches the mainstream and consumers are starting to see the benefits. There are some definite advantages to using crystal cat litter over traditional cat litter products. For one, they absorb more cat urine than clay and most other litter products. According to Kitty Catter.com, crystals generally hold up to 40% of their own weight in water, which makes them effective at keeping the litter box dry and comfortable for your cat. 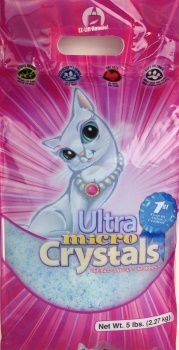 You also need to change out the litter box less often with crystals, and this litter is often sold in small bags. That can be convenient for some cat owners who have trouble lifting heavy bags of traditional cat litter. 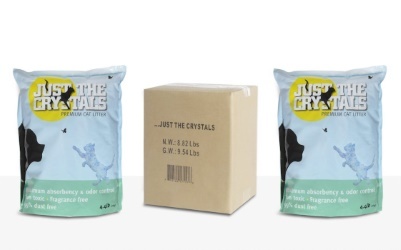 There are five crystal cat litter products we want to take a look at. We hope one of these will be right for you and your cat. One of the neatest features of this cat litter is that it comes in two bags. That means that you only need to open half the litter at once and not risk allowing all the litter to lose its freshness if you don’t use it fast enough. As with most crystal litter, there should be little to no dust and very little tracking. The scent is also very mild, which should make it appealing to your cats. It is incredibly absorbent and can absorb urine about five times better than traditional clay litter can. The litter can stick to your cat’s fur after it starts to absorb some urine, though, and that can make your cat interested in eating it as they clean themselves. The first thing you will likely notice about this litter is that it can create a lot of dust when you put it out. Dust can also fly up when your cat is using it and shift the litter around in the box. On the plus side, it is affordably priced and super absorbent. The crystals do an excellent job of soaking up liquids, and that makes it easy to just leave the litter there for a while before changing it out and having to worry about the litter box becoming a mess that your cat would want to avoid. The crystals are also very soft, and if you have a declawed cat or a cat with some physical sensitivity, then this can be the ideal litter for them. Fresh Step’s patented design only releases its fragrant, odor-killing scent when the crystals are activated. 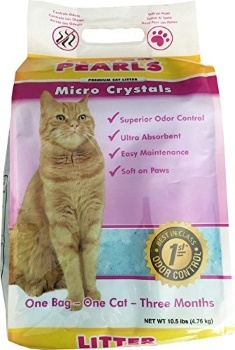 That means that you only have to smell these crystals working to kill bacteria and blocking bad odors when your cats are in the litter box and moving the crystals around. Now, the smell can be quite powerful, but since it only activates when in use, it should not be enough to drive your cats away or make them seek out somewhere other than the litter box to do their business. This cat litter is designed to be soft, so your cat’s paws should not be bothered by it as they walk on it. A lot of crystals can be too hard, and most cats prefer something softer. There is also very little dust to contend with, and cats typically love this litter. This is one of the cheaper crystal cat litter products, and in that respect, it’s an excellent buy. It lasts for a long time, and it absorbs lots of urine before it needs to be changed out. Of course, you may want to change it out before the crystals are fully used up. 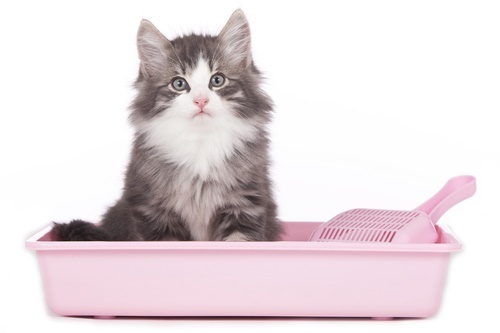 The smell can be overpowering from the cat urine that’s in the litter box. That’s because Just the Crystals does not do a lot to negate foul odors. It does some but not as much as many of the other choices on this list, and if you have stinky cats or have the litter box placed in an unventilated area, then this may not be the best choice for you. 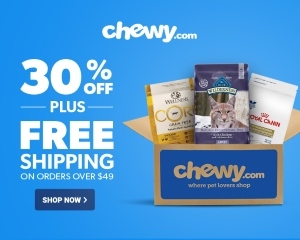 This is one of CatLitterHelp.com’s top choices for crystal cat litter. It’s a little on the pricey side, but it does provide powerful control for odors. You should not smell anything nasty from the cat litter box for about a week, even with a few cats using the same litter box. It’s a very absorbent crystal as well, and it often keeps the urine from settling at the bottom and creating a mush. This is also a fairly tracking free crystal litter. There should not be much to clean up when the cats use the litter box, and it should just take a few uses of the scoop to get the litter looking fresh again. However, it does create a lot of dust sometimes, and you need to be aware that your cat may be bothered by the dust. It won’t be as much dust as conventional, non-crystal cat litters create, but it can be a lot for a crystal litter. Don’t use crystal litter with declawed cats– Not all cats can handle the rougher surface of the crystal, as compared to traditional cat litter granules. 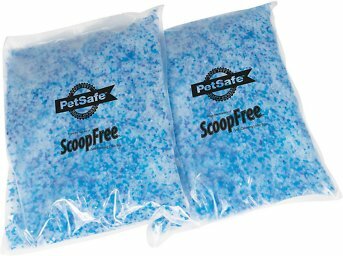 If you have a declawed cat, then you need to realize that its paws will be very sensitive, and it may not want to use this litter, as per VetInfo.com. Buy a small bag- You won’t need a lot of litter to start with if you are buying crystal cat litter. It doesn’t have to be changed out as often as regular litter, so try to forgo spending a bunch of money on a big bag at first to see how long a small bag lasts you. Watch the smell- When buying any kind of litter, crystal or otherwise, be sure to check how strong the scent is. Most cats won’t like a strongly-scented litter, and you don’t want to waste your money on something like that. Buy appropriately- If you have kittens, then you want to wait on the crystal litter for now. They tend to eat this kind of litter, which can be very dangerous for them, as per Consumer Research. There you have it- our look at the very best in crystal cat litter products. Maybe one of these will be perfect for your cat, or maybe we just gave you enough information to make in an informed buying decision. Either way, we hope you enjoyed our look at crystal cat litter and found something of use here. Please feel free to look at our many other guides for finding the right litter for your cat.